Boost user productivity and provide an excellent user experience by incorporating key Apple technologies, such as UIDocument, Open in Place, Document Provider Extension, and iCloud Drive, into your document-based app. Basing your document strategy on UIDocument implementation frees you to focus on your app’s specific needs. Benefits include automatic file coordination that improve reliability, asynchronous reading and writing for a smoother user experience, and robust change tracking and conflict resolutions for more predictable results. By implementing Open in Place, you empower your users to organize and work on documents in the way that works best for them. You can store documents in your own app container, in a folder on iCloud Drive, or even in a third-party cloud provider’s app container. Open in Place lets multiple apps simultaneously edit an individual document, freeing users from the burden of keeping track of multiple copies in different locations. By supporting Open in Place, you can create a truly seamless document editing and collaboration experience your users will love. Putting documents into iCloud Drive is a great way for users to access their content across all of their devices. When you add support for iCloud Drive, your users can easily move from one device to another while always working with the latest version of their content. 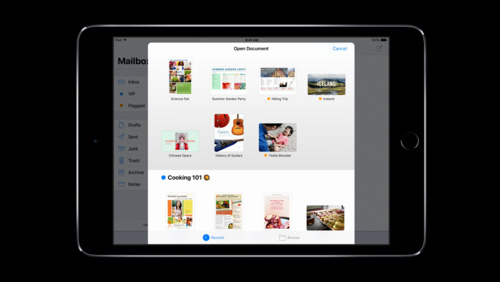 iCloud Drive also lets users organize their content in the way that works best for them. When implemented with Open in Place, multiple apps can collaborate on documents easily to maximize productivity. Watch the WWDC 2017 session "Building Great Document-based Apps in iOS 11" to learn about building document-based apps and providing a great user experience.